Find us at four convenient locations! This is frequently updated with information about orthodontics. If you’re an adult with misaligned teeth, there’s a good chance you’ve been put off getting orthodontic treatment by the thought of having to show off a mouth full of wires and metal studs for a year or more. Fortunately, and unknown to most people, there are plenty of discrete orthodontic treatments available, and nothing can quite compare with lingual braces for invisible orthodontic treatment. 1. WHAT ARE LINGUAL BRACES? Lingual braces are a bracket and wire system much like traditional braces, but with a very important difference: they’re bonded to the back of your teeth (the tongue or ‘lingual’ side). This keeps them completely hidden from view at all times. The only way anyone will know you’re having orthodontic treatment is if you tell them — and even then they won’t be able to see unless you’re willing to get into some very awkward positions. 2. WHAT ARE THE BENEFITS? The biggest benefit to lingual braces is the fact they’re completely invisible to the outside world. This makes them ideal for adults and professionals who are required to keep their teeth clear and visible, such as models, TV personalities, and actors. Another benefit of lingual braces over other discrete options such as Invisalign is that lingual braces do not rely on user compliance. The braces cannot be removed at will and so cannot be lost or forgotten, and there’s no potentially awkward removal process when dining out. For this reason, they’re particularly suitable for people who want a discrete orthodontic option but don’t trust themselves to remember to put removable aligners back in. 3. WHAT’S THE PROCESS LIKE? Lingual braces are a much more technically complicated procedure than traditional orthodontic appliances. Because of this, there’s a slightly longer waiting time between the start of the treatment planning and the braces actually being fixed. It also makes lingual braces a bit more costly, accounting for the more bespoke nature of the treatment. After that, however, it’s business as usual. Like any orthodontic treatment, there’s some initial discomfort as the mouth gets used to the appliance, but patients tend to get used to the system fairly quickly and don’t report any further issues. A series of follow-up visits to the dentist will be needed to adjust and maintain the appliance, and in 6-24 months the treatment will be over, depending on the individual case. 4. IS THERE MORE THAN ONE OPTION FOR LINGUAL BRACES? There are several ways lingual braces can be applied. The first and most obvious is as a full set for upper and lower arches for people needing a full orthodontic treatment. Lingual braces can also be applied as a cosmetic option to only adjust the front six upper teeth of the mouth. This is usually done for those who otherwise have a good jaw alignment and adequate mouth space. Some people with slightly smaller mouths might get a lingual appliance on the upper teeth and a ceramic traditional appliance on the lower teeth to allow more room for the tongue in the mouth. This makes the treatment slightly more noticeable, but white ceramic braces on the lower teeth are still very discrete and difficult to notice. Like with traditional orthodontics it is ideal to switch to a soft food diet for the beginning of treatment to get the best results, which many people find to be a major inconvenience and more than a little off-putting when considering orthodontic treatment. Aside from that, the biggest benefit of lingual braces leads to the biggest challenge: keeping them clean. Since the braces are out of sight it’s difficult to check to see if any food has become stuck and accurately dislodge it. This means you have to be extra diligent with your oral hygiene while undergoing lingual braces treatment otherwise you’ll start to have plaque buildups. Luckily for you, your dentist and or oral hygienist will be there to give you thorough care instructions at the start of treatment and will always be available to provide a check and clean for you if you think you’re struggling. Follow the directions given to you, go to your scheduled checkups, contact your dentist if you have any issues, and you’ll be on the road to a beautiful set of teeth in no time. Please do not hesitate to contact Orthosmile Orthodontics on 0402 506 602 for further enquiries or make an appointment with us for a consultation to discuss your orthodontic options. Are we too old for braces? 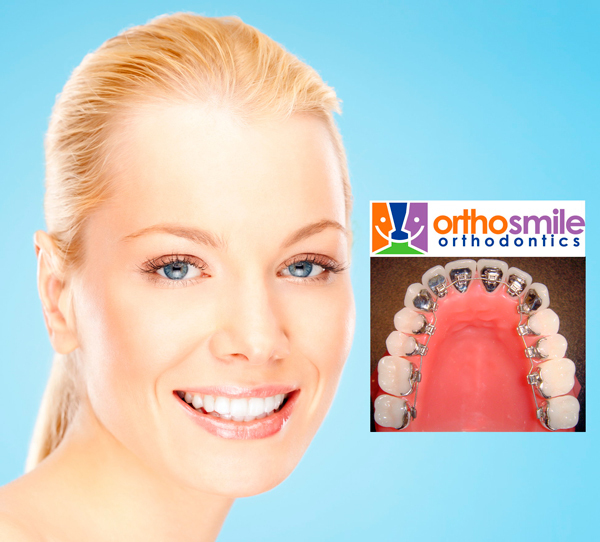 Here you will find our latest news and tips about the field of orthodontics.